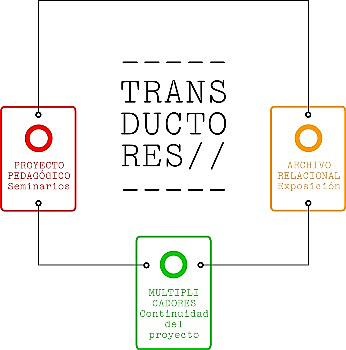 The Transductores, pedagogí­as colectivas y polí­ticas espaciales (Transducers: collective pedagogies and spacial politics) cultural project (1), conceived by Aulabierta (2) and coordinated by Antonio Collados and Javier Rodrigo and produced for the Centro José Guerrero de Granada, has been under way since 2009. The project has been divided into three lines of work: first there is an archive of case studies, (exhibited at the José Guerrero art center from December 2009 to February 2010); second, a set of seminars that have structured a pedagogical project from the outset; and third, the activation of a continuing series of multipliers in the local context of Granada, Spain during 2010. Transductores has been conceived as an organic project that links several dimensions of cultural and educational work by grouping pedagogical considerations, cultural policy and a network-group-collective policy under a single umbrella. In line with this complexity, this text fulfils a two-fold purpose: on the one hand, to analyze the types of projects, the collectives and initiatives researched and documented by Transductores in its capacity as a curatorial and archival project, taking into account the work of groups and social networks in the sphere of cultural production and pedagogy. On the other, the social-network perspective will help us describe how the project has been articulated pedagogically, i.e., how it has been activated in the local context of Granada, and how a second multiplying stage is currently being carried out. It is no longer surprising that the field of collaborative art practices or collective work is generating interest and is being revisited from various perspectives. Among other approaches, we can refer to the art history of collectivism (Scholette and Stimson, 2007), the analysis of alternative forms of art production, either though participation (Bishop, 2007), the work of dialogue aesthetics (Kester, 2004) or initiatives drawing from socio-cultural and community concerns, which stem from the work of grass-roots education and creative communities (Ricart and Saurí­, 2009). Moreover, in our state, due to the influence of certain European discourses and the development of ICTs (information and communication technologies), the education boom is breathing new life into the pedagogical field. Education is no longer being viewed as the mere transmission of knowledge or as a means of compensating curatorial practices, but instead as a critical pivot for rethinking cultural production and knowledge and finding feasible responses both to vilified relational aesthetics and hypertrophied institutional criticism. An example of this is the holding of events such as the Zemos98 collective’s Educación Expandida (3) (Expanded Education); the international seminar Acciones Reversibles (4) (Reversible Actions), sponsored by the ACVIC Art Center in the city of Vic, with a recent publication that refers to the seminar and other projects; and MUSAC’s (5) Producción Cultural Crí­tica (Critical Cultural Production) symposium recently held in León. It is important to place our project in that perspective, since our work was influenced both by collaborative cultural practices and by experiences in grass-roots education or cultural pedagogies, all of which were inevitably viewed from the point of view of the complex Aulabierta project. Aulabierta is a self-managed production network and platform that helped us focus when we were rethinking how to curate an exhibition linking education, activism and networking with a set of 14 international initiatives under the umbrella of Transductores. The aim was to initiate this research in order to launch a pedagogical project and a network activating process, as we will explain below. The use of a complex term like transducer as the title of the project was also a personal gamble. Our aim was not so much to create a paradigm for a cultural policy practice or a brand, but a richer, and also more complex overview of certain projects that we found difficult to label simply as social art, collaborative, cultural-work networks or independent production projects. In this case the use of this term helped us to approach these practices from another point of view. In principle we thought of using the conventional definition of the term, i.e. a device that can translate or transform a given input energy into different output energy (the conventional definition in physics or electronics) (6). We discovered, however, that the term as used in network theory and participative research offered us a more sophisticated way of using and approaching the concept. Thus, based on Villasante’s (2006) ideas, we are now aware that transductive styles are organic and ecological forms of working that emerge in given situations and lead to deep-seated social changes. It is important to point out, however, that such changes do not depend solely on an external catalyst or trigger, which is something that is all too often attributed to art, as if it were expected to play the role of saviour. In the case of transduction, the direction and depth of change depends on the players, the context and the circumstances in which the process of change takes place. Upon grasping this connotation, we saw that in effect the perspective of transduction enabled us to approach group work from complex perspectives, understanding its contexts, rhythms and the ways in which political collaborations or coalitions are formed. In this way the different initiatives researched could be used as transducers in relation to the social agents, rhythms and social networks interwoven in each initiative. Making use of this approach, we came up with a definition of transducer as not just a device or trigger, but as a poetic and political concept that could go beyond the groups and be used as an approach. This meant viewing the initiatives selected as living organisms in constant movement.